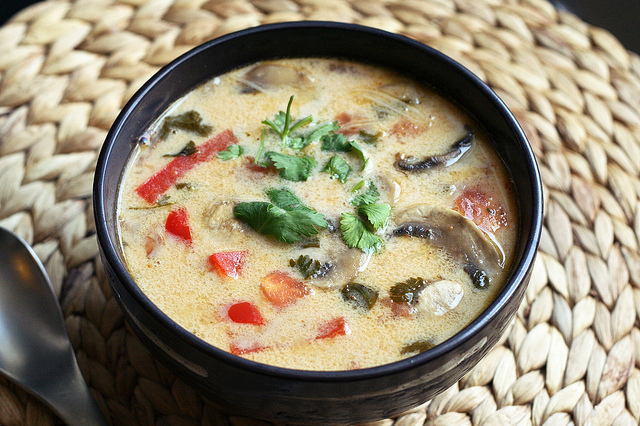 This classic Thai soup is a complete meal in one bowl. It takes just 20 minutes to whip up, making it a good back-pocket weeknight meal. It was voted favorite soup at one of my cooking classes both for its flavor and quick, easy preparation. It can be made with chicken or shrimp. 1. If using shrimp: In a large pot, bring all ingredients, except for cilantro, lime, cabbage and shrimp to a boil. Let it boil for 5 minutes. 2. Lower heat to a simmer. Add shrimp and lime juice and cook on low until shrimp is cooked, about 3 minutes. Garnish with cilantro and cabbage, and serve. 4. If using chicken: In a large pot, bring all ingredients, except for cilantro, cabbage and lime to a boil. Let it boil for 5 minutes or until chicken is cooked through. 5. Remove from heat. Stir in lime juice, cabbage and cilantro.